We are asking for your help to make a difference in the lives of the less privileged. Please go to our Donate Button to send your contributions or you can mail us a check or money order payable to Umuada Ndi-Igbo in Diaspora, using our mailing address included in this website. Umuada Ndi-Igbo in Diaspora Inc. Los Angeles and Inland Empire chapters in the state of California, on December 6 2015, awarded scholarship to nine college students residing in California. Each student received a check of $500.00 towards their college education. This is a part of ongoing humanitarian services and community outreach by Umuada Ndi-Igbo in Diaspora Inc. chapters all over the States, which began since inception. The grand ceremony took place during the Igbo church service at Saint Elizabeth Ann catholic church in Ontario California. It was attended by many people in our community, Ndigbo, friends and well-wishers, and many Umuada Ndi-Igbo in Diaspora members. Our special guests of honor, Dr. and Mrs. Iheanacho Emeruwa, whose generous cash donation made the scholarship awards possible were there to witness the award ceremony. It was indeed a special occasion and we thank God for His blessings. Our sincere appreciations to Dr. and Mrs. Iheanacho Emeruwa for keeping their promise and for their continued support to Umuada Ndi-Igbo in Diaspora Inc. We thank the Reverend Fathers for the Thanksgiving Mass and for the opportunity to celebrate this remarkable event with them. Our big congratulations to our well deserved scholarship recipient. We wish them success in all their endeavors. Special thanks to the scholarship committee for good job well done. Umuada Ndi Igbo In Diaspora Inc., Bay Area, Northern California Chapter in collaboration with Turlock Gospel Mission, on Thanksgiving Day,November 26, 2015 served food to 400 homeless population in Central Valley California. They donated their time, resources, (approx. a box of 20 turkeys and other condiments) as needed for the thanksgiving meal. This is a part of the ongoing community services in Umuada Ndi-Igbo in Diaspora Inc. chapters all over the United States of America. Congratulations Bay Area California, Keep up the good work and service to humanity. This is our mission. Raleigh, North Carolina – Umuada Ndi-Igbo In Diaspora Inc. & TM RTP Chapter last Saturday November 14th, 2015; hosted a Community Healthfair as part of their volunteer services to give back to their Nigerian Community. The event which started with an opening prayer by Bishop Tyrone & Evangelist/Mrs. Adaoha, featured free blood pressure screening by the Vice Coordinator Mrs. Ngozi Anaenyeonu (Nmaluruno ); Idu Chioma Nwadiaro Okoroafor ( Nmazuruoke ) chapter Secretary. Mrs. Ngozi Oparaocha-Agu gave teachings on Women Empowerment, while Adelman Richard, MD facilitated teachings on Prostate cancer and tips on healthy living. Ekele Ngwadom (PhD) counseled the Youth & Teanagers, Chika Harrison ( National Publicity Secretary) gave an overview of Diabetes prevention and care, Maria Ohaeri (Chapter Project Director) presented Hypertension prevention and management, Pamela Ulasi Uzziel performed didactic teachings to children on hand washing techniques and our able dynamic Coordinator Agboma (Radiance) gave a Breast Cancer awareness to men and women and how to perform Breast Self-Exam Education. The event was well attended by members of Umuada Ndi-Igbo In Diaspora RTP N.C Chapter friends and family, some members of Nigerian community in Research Triangle Park Areas and the general public. Thanks to everyone that made out time to attend despite your tight schedule. A huge thanks to all our special guests: Obi Umesi, MD in attendance and on-call, Adelman Richard, MD and Ekele Ngwadom, PhD and to you all the Ezinwada’s that contributed both your monetary and human efforts to actualize this endeavor, I pray that He that rewards without wavering, the Lord Jesus rewards each of you ladies your labor of love especially your reaching out towards affecting people’s life positively where you can. You ladies ROCK!!! Raleigh, North Carolina – October 18th, 2015. Umuada Ndi-Igbo In Diaspora Inc. Tm Raleigh North Carolina Chapter fed 50 Homeless People through the help of Mrs. Maria Ohaeri (Umuada Ndi-Igbo Project Director) and Mrs. Pamela Ulasi (Assistant Spiritual Director), with earthly physical food and Heavenly spiritual food (word of God) at Salisbury Street, Raleigh North Carolina; as part of our Volunteer Services Project to give back to the Community where we live. Five Homeless persons became Christians and gave their life to God. The faces and hearts of the homeless persons were full of smiles and joy – as we fed, hugged, embraced and had fellowship with them in love. What a beautiful way to affect people’s life positively where we can and to give back to the community where we live. BRAVO TO YOU ALL THAT MADE IT HAPPEN, YOU LADIES ROCK!!! YES WE DID IT!!!! IMPRESSIVELY BEAUTIFUL!! ELABORATE !!!!! MAGNIFICENT!!!! EXTRAVAGANTLY SPLENDID!!!!!!!!!!!!! The Founder/National President Chief/Lady/Mrs Adaozo Grace Nonye Agude-Ada Zuruigbo gburugburu and all the National Executives of Umuada Ndi-Igbo in Diaspora Inc. Tm. took Atlanta by storm as they induct Atlanta chapter on August 29, 2015.Each chapter across the globe was represented including New York, New Jersey, Baltimore Maryland, Los Angeles California, Inland Empire California, Bay Area California, Las Vegas Nevada, Raleigh North Carolina and Nigeria. Our special guest of honor, Honorable Commissioner for Planning and Economic Development Imo State Government, Nigeria Mrs. Adaora Ijezie and her entourage were present to kick-off fundraising for our proposed Seven Igbo States of Nigeria Cassava Processing Mills which will commence in December, 2015. Join us in New Jersey October 8-11 for the official launching of this project. More details and pictures coming soon. Umuada Ndi-Igbo in Diaspora Inc.
INDUCTION/INUGURATION OF THE ATLANTA, GA CHAPTER OF THE UMUADA NDI IGBO IN DISAPORA INC. It happened live on September 6th 2015 @ st Anthony’s church Hall, Umuada Ndi Igbo Baltimore Maryland chapter hosted a Back to school/Empowerment Night for all children in our Baltimore community…maka umu anyi. It was very successful because the Baltimore Umuadas understand that: “They are our children, we owe them our blessings, words of encouragement to empower them to be the best at school”. The children enjoyed lots of fun activities, received free school supplies, delicious refreshments served, music and most importantly Empowerment Counselling to all the children was given by our special Guest Speaker Rev. Fr. Godswill Agbagwa. We thank every one that participated in one way or the other to make it a happy hour for our children. Most importantly, we thank God Almighty who makes all things possible, for our own good and for the good of others. 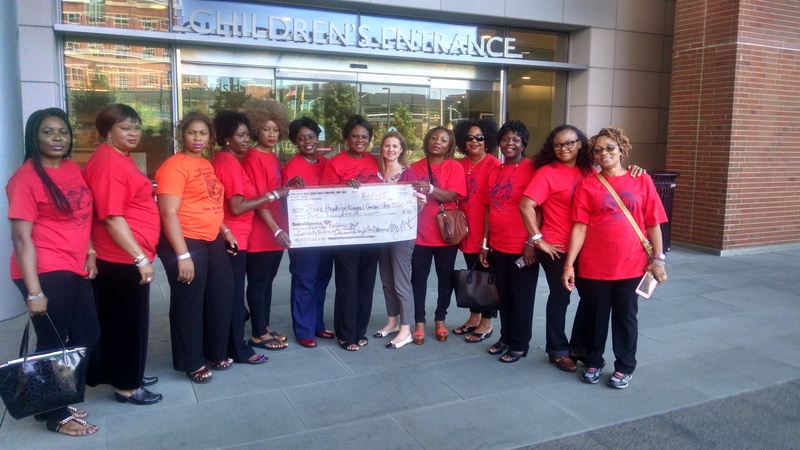 As part of our Community/ Volunteer Services efforts, we, members of Umuada Ndi-Igbo in Diaspora, Inc. Raleigh N.C Chapter visited Wake Medical Children’s Hospital to give back to the Community we live and to thank Wake Medical Hospital for being the only pediatric inpatient care provider in Wake County, that ensures area families have access to the care they need and deserve and for their care to thousands of babies and children each year and always providing the highest level of care to our youngest patients. One of the Mother’s in the picture and video later testified of Wakemed’s care, love and passion for baby. We made goodwill donations to Ronald McDonald’s Children’s Center. We were received by the Director of Nursing and the Wakemed Volunteer Services Coordinator. What a beautiful team efforts!!! Umuada Ndi-Igbo in Diaspora Baltimore MD Chapter has done it again. The members today Friday, August 21, 2015 visited Johns Hopkins Hospital Children’s Oncology Unit and made a donation to the unit to support their research activities into the cure for cancer. We are very proud of you, Umuada Ndi-Igbo in Diaspora Baltimore. Ifeanyi Añunihu. Congratulations to Umuada Ndi-Igbo in Diaspora Inc. Tm. on the ongoing mobilization and empowering of Igbo women across the globe for Igbo unity and progress. The recent addition of two new chapters of Umuada Ndi-Igbo in Diaspora in the United States of America added to the growing number of reputable Igbo women ready to make a difference in our society through our noble organization. Since inception, our organization has maintained a structured leadership and goal oriented strategies geared towards a mission, one that not only benefits our Igbo communities, but the entire human race at large. Evidenced by the numerous humanitarian activities ongoing in all our chapters all over the States, it is then suffice to say that Umuada Ndi-Igbo in Diaspora Inc. is an organization of determined women and of profound repute. It is then of no surprise, that many Igbo women are eagerly joining to be a part of this great movement. 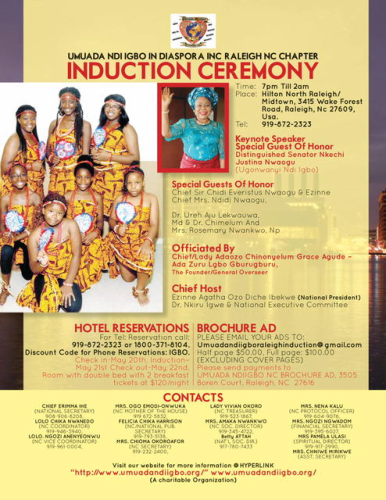 On October 9, 2014 and February 7, 2015, the National Executives of Umuada Ndi-Igbo in Diaspora respectively launched the Atlanta Georgia and the Northern California chapters, marking their official welcome to the family of Umuada Ndi-Igbo in Diaspora Inc.
On February 22, 2015, the National Executives Inaugurated Atlanta chapter and swore in the chapter Executives to commence the great work which the organization was well known. Those remarkable events have become the “talk of town” and Umuada Ndi-Igbo members all over the world are celebrating and thanking God. I write to congratulate the two new chapters on their bold steps of accepting the challenges of making a difference in our society through Umuada Ndi-Igbo in Diaspora Inc. I congratulate the entire newly sworn-in chapter Executive whose duty is to continue the wonderful leadership our organization has maintained. I am confident that as Executive members, you will abide by the norms of this model organization and discharge your duties diligently towards more fruitful outcomes. I must congratulate the entire National Executives of Umuada Ndi-Igbo in Diaspora Inc. for continuously maintaining outstanding leadership. I extend my sincere appreciation to the Founder/National President, Chief Lady/Mrs. Adaozo Grace Nonye Agude whose ardent leadership has propelled this organization to a high level. I thank you for the excellent launching and inaugural ceremonies of our new chapters. Also to the Regional Coordinators, Lady/Mrs. Christy Ejiogu and Ezinne/Mrs. Ozo Agatha Ibekwe, the National Secretary General Mrs. Chime Okafor and the National Financial Secretary Mrs. Carol Egbo for contributing to the successes of the two magnificent events. Umuada Ndi-Igbo in Diaspora Inc. forward ever! backward never! We are moving up and moving in a big way. All our achievements are through the grace of God. Let us continue to praise Him for all His blessings upon us. We pray that He continues to lead and guide all of us in our endeavors. Amen! Long live Umuada Ndi-Igbo in Diaspora! Long live Ndi Igbo! Long live United States of America! Long live our country Nigeria! Ezinwada di ogos! The gong has sounded, the bells are ringing, and my phone has lost its voice. The Eagles have landed and flying high for Umuada Ndi-Igbo in Atlanta. The Inauguration we did this past weekend was one of a kind. My beautiful ladies of Umuada Ndi-Igbo Atlanta showed their southern hospitality to our wonderful national executives…Our national president and founder Lady Adaozo Grace Agude, the only ada zuru Igbo gburu gburu and her entourage: Lady Christy Ejiogu our East coast regional coordinator and the only Ezenwanyi in Umuada Ndi-igbo, Mrs Carol Egbo our national financial secretary- Nma atulu order, and Mrs Chime Okafor our national Secretary-general and the only Odera gburu gburu . It was a day to remember as the movers and shakers of Umuada ndi-igbo travelled far and beyond to celebrate with us. Thank you all for keeping our national executives warmth with love and for keeping Umuada Ndi-Igbo flag flying. The difference is clear; there will be no match to equate our organization in Atlanta. We will be waiting for our induction showdowns come this August. Thank you all, the beautiful ladies of Umuada Ndi-Igbo for your proper conducts, hospitality, and attention to details. To my executives, words cannot describe the energy vibes that filled the room. I say thank you. Most importantly,for believing in me. Now, we have come and conquered we need to show intending members how leadership is done in a women organization specifically Umuada Ndi-Igbo in Diasporas USA where hierarchy of leadership is eminent and functional. Thank you for a job well-done!!! I could not have done it without your support. Umuada Ndi-Igbo….Chukwu chiri anyi eze yessoooo. UMUADA NDI-IGBO IN DIASPORA INC. BAY AREA- SACRAMENTO, NORTHERN CALIFORNIA LAUNCHED ON FEBRUARY 7, 2015. Launching of Umuada Ndi-Igbo in Diaspora Northern California (Bay Area) chapter. February 7 2015. 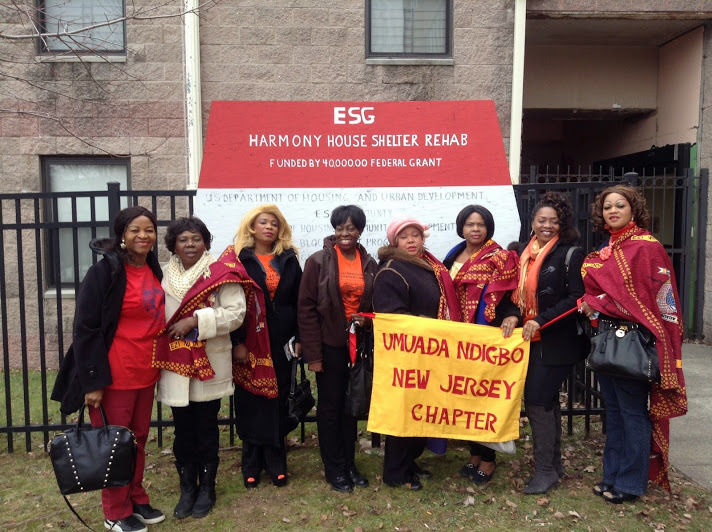 Umuada Ndi Igbo New Jersey Chapter on the move to Harmony House Shelter and Rehab!!! Little flakes of snow falling on Umuada Ndi Igbo New Jersey Chapter led by their coordinator Dame Ivy Onyejekwe, who mobilized her fellow Umuada Ndi Igbo New Jersey Chapter to Harmony House Shelter and Rehab for woman and children, to give a charitable donation of five hundred dollars ($500). NATIONAL SECRETARIAT OF UMUADA NDI-IGBO IN DIASPORA, INC. & TM. Nigeria Independent Parade October 2014. Umuada Ndi-Igbo in Diaspora New York chapter participated displaying patriotism and commitment to our country Nigeria. They won a beautiful Trophy for excellence and beauty. Congratulations New York chapter. UMUADA NDI-IGBO IN DIASPORA INC. TM DONATES GENEROUSLY TO SICKLE CELL ADVOCACY FOUNDATION NETWORK NEW YORK TO HELP FOR RESEARCH AND CARE OF PEOPLE WITH SICKLE CELL ANEMIA. To Umuada Ndi Igbo, this is announce that NY chapter of Umuada Ndi Igbo during their meeting on 3/16/14 presented a check of $1000.00 to an org know for their work with people with Sickle Cell which last year took the life of one of our members son, this organization lead by Ms Gloria Rochester is known as Sickle Cell Advocacy Foundation Network NY chapter.Check was presented by NY chapter Coordinator and her executives during the meeting, different pictures were taken with the two org representatives that came. NY chapter of Umuada have started with their charity work, therefore we say more grease to Ms Vero Aneke VPower and her members. At the request of the two ladies that came from Sickle Cell Foundation they would like to work with Umuada towards helping people with same problem in Nigeria and other parts of Africa. It sounded good to our ears, because our Founder Chief Agude is always looking for ways Umuada can help people at home. Umuada Ndi-Igbo in Diaspora Inc. Tm. is reaching out and giving back to the community. In December 2012, Los Angeles chapters organized a Toy Drive that benefited many sick children in Los Angeles Children’s Hospital, Los Angeles. Umuada Ndi-Igbo joined the Martin Luther King Parade of January 2013 and participated actively. Members actively raised funds in 2013 for activities that benefited the less privileged in their communities. For Women and children issues Umuada Ndi-Igbo visited various Battered Women Shelters in Southern California with gifts, cash and prices donated by members and their families. I salute you all, on behalf of the leadership of Umuada Ndi-Igbo in Diaspora, Inc. I am also extending my very sincere appreciation and gratitude to you all, including your respective families and loved ones, for your membership in this wonderful movement of Igbo daughters, and for the privilege of serving you as leader and partner. I want to begin by thanking all our dedicated and hardworking members, our supportive spouses, families and friends, for being positive and believing in your selves. Thank you also for remaining faithful to the ideals of our beloved Umuada Ndi-Igbo in Diaspora, Inc., especially its lofty goals, objectives, and the great philosophy behind it. I thank you from the bottom of my heart, for the confidence and trust you repose in me as your leader, and for the priceless support you have given to the National Executive Committee all these years. Fellow Umuada, we had said from the very onset that Umuada Ndi-Igbo in Diaspora, Inc. was not founded because of lack of enough social groups or “august meetings” in the Igbo communities in the United States and other parts of the Diaspora. This organization was not founded because Igbo women in the Diaspora did not have a platform or forum to showcase or display their high societal status, English Language proficiency, material wealth, beauty, or even how much cheap talk they can generate and propel. Heck no! That was never the case!! Rather, Umuada Ndi-Igbo in Diaspora, Inc., as we all know, was founded out of the genuine need for a veritable umbrella organization of Igbo women (from all seven Igbo speaking States of Nigeria) in the Diaspora, aimed at mobilizing our well-endowed Igbo women, financial, and other resources to help bring about positive change to ourselves and our people back home. Of course, Umuada Ndi Igbo in Diaspora, Inc. also came to being, to help infuse that “igboness” into the children we are making and raising here in the Diaspora, as well as to preserve and protect our rapidly eroding Igbo Language & Culture. In fact, this organization was founded when it became obvious that no outside-based organization (with roots outside of the Diaspora), no matter how well-intended, has what it takes to provide a platform that could encourage unity, independence, mutual respect amongst umuada here in the Diaspora. This organization is to help harness the God-given talents/resources of Umuada in Diaspora, in the most efficient and professional way, to the benefit of our communities. It has always been our belief that only an organization that has its roots, rather than just its branches in the Diaspora had any real chance to survive and carry out its goals. That is exactly how Umuada Ndi-Igbo in Diaspora, Inc. came into existence! A real child of necessity! As we rightly anticipated a few years ago, WE HAVE NOT ONLY SURVIVED, WE ARE ACTUALLY WAXING STRONGER AND STRONGER WITH EVERY COMING DAY!! As has been the tradition, time has come again for us to pause and take stock of how far we have come in the past one year. To do so, we must first thank God Almighty for His infinite GOODNESS AND MERCIES. We thank Him for blessing and guiding us through the year. We also pray for His continued blessing as we look forward to brighter times ahead. I thank you all, immensely, on behalf of the National Executives of Umuada Ndi-Igbo in Diaspora Inc., for your dedication and hard work that has resulted in building this strong and magnificent organization. You all have undoubtedly given all of your efforts, talents, time, and money to make our vision a reality. You all have firmly held to what you believe is right and proven to the world that you are women of honor, principles and tested integrity. My beloved sisters, during the course of the year you all have maintained a high degree of peace, unity, love, and respect for one another. Most importantly, you have impacted, supported and empowered each other in the most positive way. This is what every civilized society wishes for its members. I do, therefore, encourage you all to continue with this wonderful spirit in doing the good job of maintaining the progress of this great organization without distraction, because God has crowned us. He has made us an instrument of His infinite goodness! Amen!! I must specially thank the honorable members of the National Executive, who like other respected members of this group, are made up of well-educated and highly talented and skilled women of indisputable character and exceptional leadership qualities. My dear, you are indeed the rock that solidifies the foundation of this organization. You work tirelessly and diligently to keep this organization viable and purposeful. These women of substance understand the true value of service to humanity and show profound interest in making positive impact in our society. They include: the Hon National Vice President, Chief/Mrs. Uloma Ihenachor (Obata uloadimma); East Coast Regional Coordinator, Lady /Mrs. Christy Ejiogu (Anaeriaku, Ezenwanyi Umuada Ndi-Igbo); the West Coast Regional Coordinator, Mrs. Ozo Agatha Ibekwe; the Sec-General, Mrs. Chime Okafaor; the Assist. Sec-General, Mrs. Majesta Awuzie; the Treasurer, Mrs. Florence Hennel-Obimba; the Fin. Sec, Mrs Carol Egbo; Asst. Fin. Sec, Mrs. Clara Iriele; Sp. Project Dir, Mrs Helen Ogbozor; Chf Protocols Officer, Chief/Mrs Erinma Ihe; PRO, Mrs Nkiru Ogbodo; Parliamentarian I, Mrs. Ngozi Nyenke; Parliamentarian II, Lolo Elizabeth Obiefule; Natl Legal Advisor, Mrs Sylvia Alugbue. Thank you all very much. I am not forgetting the sacrifices and contributions of the National Committee Members. They include: New York Chapter — Mrs Vero Aneke (Coord); Sis Pat Mmekamkwe (Asst. Coord); Los Angeles Chapter—- Mrs Nnenne Bosah( Coord); Mrs Amaka Okpala(Asst Coord); Inland Empire of Cal—-Mrs Mary Meregini(Coord); Mrs. Lovelyn Anyanwu(Asst Coord); Houston, Tx—Chief/Mrs Becky Oji(Coord); Lady Nnenna Anokwute (Maryland Coord); Mrs. Chinonye Ukabi(Asst Coord); Dame Ivy Onyejekwe ( New Jersey Coord); and Lady Cecelia Okoli (New Jersy Coord); Connecticut—Chief/Mrs Helen Eneh. Thank you all so very much, my dear sisters, for the good work you are doing in your respective states/chapters. To the rest of the members of Umuada Ndi-Igbo in Diaspora, Inc., this is what I want to tell you: I truly appreciate your selfless and meritorious services, as well as your devotion to the affairs of Umuada Ndi-Igbo in Diaspora, Inc. Thank you very much for everything you do for this organization. I particularly want to thank the Founding Mothers, who on that faithful day of November 23, 2010 stood firm, and courageously made a decision that has positively impacted (and will continue to impact) the lives of all Umuada living and working in the Diaspora and back home in Nigeria. It was that wise decision they made on that day that gave birth to Umuada Ndi-Igbo in Diaspora, Inc. You gave us the opportunity to open our eyes and realize that, as Umuada Ndi-Igbo in Diaspora, our destiny should lie in our own hands. You have proven that we stand to benefit more from collectively/democratically formulating our own policies and define our goals/objectives, rather than being controlled and directed from thousands of miles away – of course, with no consideration as to the uniqueness of the Diaspora environment/culture we find ourselves in. Thank you very much. We are all indebted to you for your wisdom and foresight. My dear sisters, it is common knowledge that since the founding of Umuada Ndi-Igbo in Diaspora, Inc. in 2010, we have not only won the hearts and endorsement of the entire Ndi-Igbo… We have also made quite some tremendous & tangible achievements, in spite of pockets of distraction popping up here and there, from time to. 501(c) (3) Status: UmuadaNdi-Igbo in Diaspora, Inc. is duly registered with the Federal Governement and State of California and all other participating states as a non-profit organization. It is Trademarked and registered! Holding Annual Summits in all the component chapters of Umuada Ndi-Igbo. Liaising with women in Nigeria(thanks to the efforts of the West Coast Coordinator, Hon Mrs. Ozo Ibekwe) with the intention of setting up chapters in Nigeria. Plans underway to establish cassava processing plants in Nigeria to assist and empower local women. Plans to commence the writing of grants to help us establish our long-term VISION of setting up an UMUADA NDI-IGBO CENTER for CULTURAL AWARENESS/ WOMEN EMPOWERMRNT AND COUNSELLING CENTER… FOR WOMEN/CHILDREN VICTIMS OF ABUSE AND NEGLECT, AND FOR SHORT-TERM HOUSING in all fifty states of the USA. Umuada Ndi-Igbo recently created waves in Nigeria National politics by weighing-in on the Child Marriage Act at the Nigeria National Senate. Standardized (across the boards) increase in bereavement benefits for all chapters in the union. The leadership/Organization received AWARDS of MERITS and Excellence from Mayor of Newark NJ, November 10th 2013 in Newark NJ. Outreach to offer financial and moral assistance to patients in the children Hospital in Los Angeles. Participation by the Los Angeles Chapter in ABC CHANNEL 7 organized Toy Drive to benefit less privileged kids in Los Angeles. Outreach to offer financial assistance to the Women Shelter, organized by the Los Angeles Chapter. December, 2012. Combined California Chapters’ participation in the Dr. Martin Luther King Memorial Day Parade in Los Angeles last January. Outreach by the Inland Empire Chapter to offer financial and moral assistance to the Women Shelter in the city of Riverside California on Thanksgiving Day. The New York Chapter Toy Drive to benefit the less privileged kids in their community organized last year, December. You can see we are doing fine! This could not have been possible without you, fellow Umuada!! So thank you all very much. The National Executive Committee of Umuada Ndi-Igbo in Diaspora, Inc. has much trust in you, and appreciates your untainted faith in this organization. Fellow Umuada, the road has not been all smooth for us. We have had some bumps on the way. So much distraction by way of misleading information has been put out there about Umuada Ndi-Igbo in Diaspora, Inc. by some individuals and groups. I am, however, thankful to you for demonstrating so much civility in the face of all these negative campaigns against this organization and its leadership. Many of you have worked tirelessly to project Umuada Ndi-Igbo in very positive light. I am very proud of you and say “THANK YOU”. Please put your hands together and give yourselves a sound round of applause. You deserve it, my dear sisters. Please keep it up! Over the course the year, some of our members went through the pain of losing loved ones, like parents, uncles/aunts, brothers/sisters, etc. But the most crippling incidents to this organization was the loss of the spouses of two of our members—- one in Maryland (Late Mr. Okororie) in March this year; and the other in New York( Late Mr. Aghanwa) last August. We also lost a 20 year – old son in New York (Late Master Uzoigwe) this past November! These were all very traumatizing situations for all of us. I pray for the Good Lord to continue to give the bereaved families the strength to cope with these huge losses. I also thank the wonderful members of Umuada Ndi-Igbo in Diaspora, for all the support and prayers they extended to the bereaved families. May the Lord give the departed souls Eternal Rest in Peace! Amen. Gorgeous members of Umuada Ndi-Igbo, we should not forget the fact that we could not have succeeded in achieving anything had we not stayed united, remain focused and dedicated to our set goals and objectives. I have no single doubt that we have what it takes to move even mountains. But we first have to be on the same page on issues. 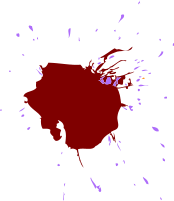 We cannot possibly agree on every issue, but we should not also fall into the temptation of resolving our differences by resorting to chaos and bad blood. We still have a long way to go. But we should be able to stand up together and take our collective destiny into our own hands and move on to building a very formidable Umuada Ndi-Igbo in Diaspora, Inc.
Let me at this point take a few moments to acknowledge and appreciate those individuals who have in one way or the other supported us from the very beginning. I will start with our spouses. I do sincerely thank our husbands, who are actually our backbones and the pillars that hold this organization together. Without their support and encouragement, we would not have achieved anything. Thank you, our dear husbands, for the love, understanding and unalloyed support you have given us throughout the year. You have always been there for us through tough times, and never complained even at those times when we might have put the concerns of Umuada Ndi-Igbo over those of our families. Thank you very much. Many thanks also to our children, families and friends for all the support. In fact there is just no way can I possibly thank everybody that has in one way or the other supported or helped Umuada Ndi-Igbo in Diaspora, Inc., either individually or collectively. Suffice it to say that Umuada Ndi-Igbo in Diaspora, Inc. remains grateful to every member of our community, especially the elders, men/women of God and philanthropists, who believe in a one united and strong Igbo Nation. I wish to, once again, thank every member of this great organization for all the hard work, commitment/dedication to service, love for one another, high level of professionalism; positive attitude, clear focus & sacrifices, as well as optimism and love for Umuada Ndi-Igbo in Diaspora, Inc. You can see that our hard work, understanding and commitment to the goals and objectives of our beloved association is paying off. We all deserve a pat on our backs. Let us continue this long journey of community transformation and positive change with one voice and dedication to service. May the good Lord Bless, Guide us and show us the WAY! Amen. 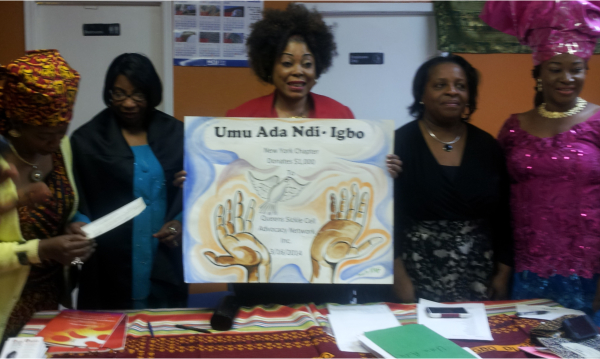 Thank you very much and Long Live Umuada Ndi-Igbo in Diaspora, Inc.
Chief Ada Ozo Lady /Mrs. 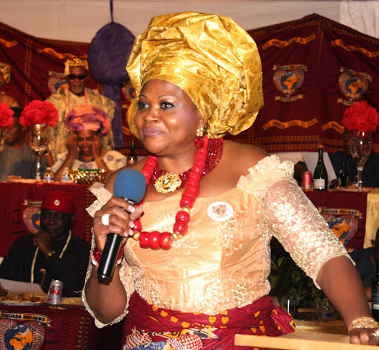 Grace Chinonyelum Agude, K of C.
Umuada Ndi-Igbo in Diaspora, Inc.